TV has become very important for many of us. They entertain us and provide so many new things. We could get information from around the world in just seconds. Reporters from all countries could be covering an event that has just happened recently. The transmission then can be sent to nearby TV stations and finally to the satellites. Once, it enters the satellite systems, viewers around the world can see what’s happening. This didn’t happen hundreds of years ago. In fact, important news like the defeat of armed forces in distant continents could be heard in the home countries only weeks or months later. The rapid spread of information has affected families around the world and parents are regularly hard-pressed to provide protection from inappropriate content, which may affect their children. Modern children are particularly curious with many things that happen around us. They are visual creatures, unlike children of less advanced era, who play outdoors and read plenty of books to get some amount of entertainment. Unfortunately, TV can be harmful psychologically and intellectually for children. They can easily access channels that show plenty of violent and sexual content. These programs can negatively the perception of children. Their long-term attitude and behaviours can be permanently affected as the result. Even if children regularly watch harmless TV shows like cartoon and other kids-friendly programs, it is quite possible that children will ignore their more important tasks. Children also need to study, socialize and play outside to improve themselves intellectually and physically. When children have their behaviours, eating habits and school grades affected after they watch TV shows, parents should take immediate step to solve the problems. TV shouldn’t also impair children socially. They need to communicate with friends of the same age to improve their social skills. Studies show that children who watch TV often and socialize less will have a more difficult time to adapt themselves during adolescence and adulthood. Parents should make sure that TV won’t take away family bonding. Instead of making families closer by allowing them to watch family-friendly programs together, it is possible that each family member has their own preferences. We often see how family members argue about what TV programs they should watch. Granted, TV can bring many benefits. Some TV programs can arouse interest on many subjects, such as history, science, sports and art. But parents should know that excessive TV watching can be very detrimental. As an example, watching sports program shouldn’t replace the actual sports sessions outside the house. As a result, children may suffer from reduced fitness, since they move much less. 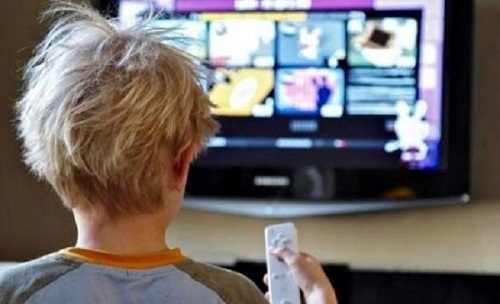 Children also prefer to watch TV while eating junk or fast food. The lack of activity and the increased intake of fat-rich food, could make children more vulnerable to obesity or other health-related issues. Lastly, some children could try to mimic behaviours of their favourite characters such as smoking. They could also try to gain access to firearms that parents keep in their room.